I am a foodie – I love to eat and recently, I have re-discovered my passion for homemade cooking. This means rigorous and sometimes labor intense sessions in the kitchen trying to prepare food. Problem is my house mate is diabetic – so I cannot get to experiment as much as I would love to. Which then leads me to clean, healthy eating. So, I cook using Olive oil for example, there is very little starch on my plate these days – and I try to stay away from animal protein [This is so hard] as much as I can. I also love to experiment using our local food – because I have come to learn that it is very healthy and very nutritious. This is why when it was Kampala Restaurant Week – the first thing I asked for was – where is the tasty Ugandan food? That is when I was told of ‘Fusion Box’ – available only on two days of the Kampala Restaurant Week – where the highlight of the meal featured was Ugandan. When it comes to our local food – we are seldom creative with it. We instead leave it to buffets. If you want good matoke – find it in a dingy place downtown OR go find a restaurant of hotel serving buffet. Not fair. My first stop was Piato Kampala Restaurant. On the menu was Oxtail Matoke. 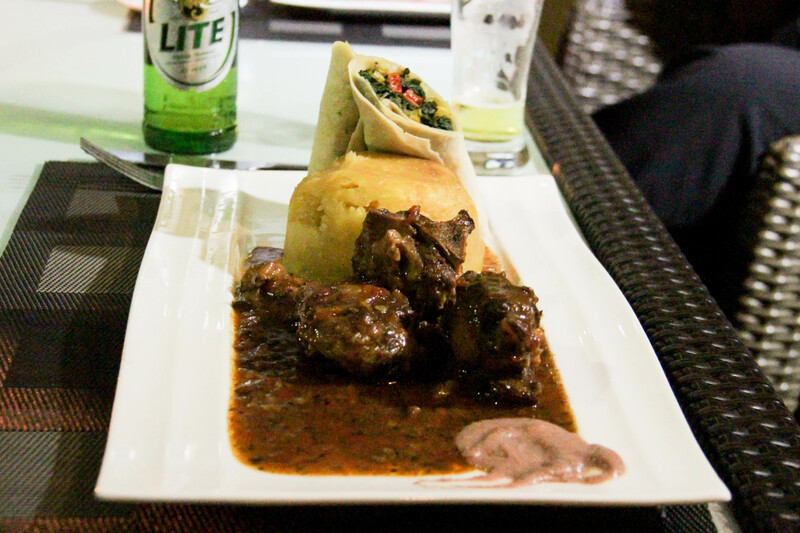 Caribbean oxtail – matoke fusion served with vegetable stuffed tortilla. The meal was a combination of elements from exotic cuisines and popular local Uganda staples that we all know and love. The meal was appealing to the eyes as it was to the taste buds. The matoke had some groundnut sauce to go with – and you can never go wrong with that combination. The oxtail – I haven’t tasted anything that good in a while. The meat was very tender – most definitely slow cooked. And yes – I actually got to use my hands. I could have done with a few more pieces of oxtail – the portions were not ‘Ugandan’ OR ‘African’ as they say. I was unable to lick my fingers – because of the fear to embarrass my guest and the rest of the fine diners in the room. Otherwise wouldn’t have minded leaving my ‘digi’ [as we used to call it in high school] at the table. I would definitely love to see more local food featured on the ala’carte menus around town.